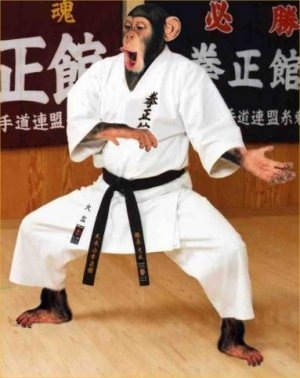 Back In The Gi » Blog Archive » Learning new kata. Kata — pre-arranged sequences involving specific blocks, attacks, stances, and movements — are central to training in traditional karate. Kata have been the main mechanism by which the art is passed on from teacher to student, and much of the progression through the ranks is based on learning and demonstrating proficiency in specific kata. Many of the self-defence techniques are derived from or built into kata (made explicit through bunkai, or the study of the applications of kata moves), and kata provide one of the best ways to work on physical precision, mental discipline, and other important components of one’s training. In short, one cannot train in traditional karate without spending a lot of time learning and practicing kata. As with other types of complex information, learning a new kata can be challenging, especially for new students. For me, having come back to training after a long hiatus, I am trying to recall or re-learn kata that I once knew, to adjust to minor differences between schools of Goju-ryu, and to learn new kata including some Goju-ryu kata and some kata specific to the Meibukan school. The order in which kata are taught differs between my old and new schools, which means that I know a couple of kata that are not required until much later in the current curriculum (if at all), and I also am missing some kata that are needed at middle ranks in my new school. So, while I have experience learning new kata and have learned a fairly good number of them in the past, I have the additional challenge of trying to (re-)learn several kata at the same time. I have learned new kata in several ways in the past. For example, in smaller classes in which the Sensei works with students of the same rank (say, all the green belts) and shows them a few moves from a new kata. Or, perhaps they may go through the entire kata, but this is still being shown move by move by the Sensei and only to students who are at the same level. 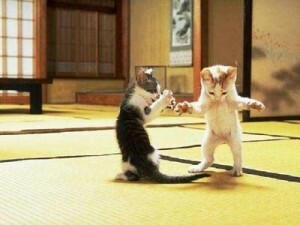 Getting all the moves to the new kata might take several classes. At the other extreme are cases in which a kata is taught in the short time frame of a seminar, maybe as little as an hour — usually this would be a kata that is from another style, or is a weapon kata, or a kata that one learns largely out of interest. In the seminar scenario, it can become a struggle to remember as much of the kata as possible. One might also hope that some fellow students manage to remember different parts of the kata so that it can be pieced together through a combined effort. In my current school, the most common way to learn a new kata is to “follow along” while a kata is performed by the entire class of junior belts (white to green). We’re not taught the kata move by move, rather we learn by imitating the higher ranked students and receive corrections from Sensei and Sempais along the way. With larger classes, this is definitely the most efficient way to proceed. However, it can make things seems pretty confusing at the very beginning of learning a new kata. 1) Don’t expect to learn it all at once. The first time you are shown or follow along with a new kata, it can seem very overwhelming. It may seem like you can’t keep track of any of the moves, and that you’re completely lost the entire time. You might even feel like you’ve lost all your coordination. That’s normal, and it passes. The key is not to expect too much the first few times you are shown the kata. If you simply expect that it will be confusing at first, you won’t become anxious about it. It’s a natural part of the process, just like the first few days in a new job or first learning to use new software or acquiring any other new skills. 2) Follow along whenever you can. Imitation is the sincerest form of flattery, and it is also a very effective way to learn a kata. Whenever possible, watch more senior belts performing it and try to follow along. As one black belt commented to me recently, at his level the goal is to follow along until he knows the kata well enough to practice it on his own. Later, he can refine specific moves in the kata and ask for clarification on details. “Fake it til you make it”, as he put it. 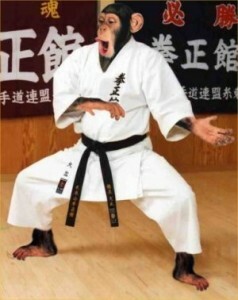 Of course, I would never claim that learning kata is just a matter of "monkey see, monkey do". This is a chimpanzee, not a monkey. 3) Practice outside of class time. You can’t expect to learn something as complex as a new kata if you practice it, at most, once or twice per week during class. It will make its way into your muscle memory much more quickly if you practice it after class and at home as well. The beauty of kata is that you don’t need a partner or instructor to practice. You don’t even need to put on your gi. 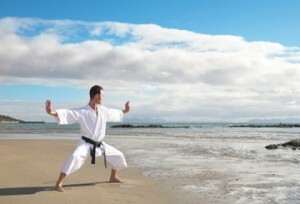 Even if you only remember a few moves of the kata, practicing them is much better than nothing. 4) Find videos of the kata being performed. In the age of YouTube, you can usually find a decent example of the kata being performed by a black belt. 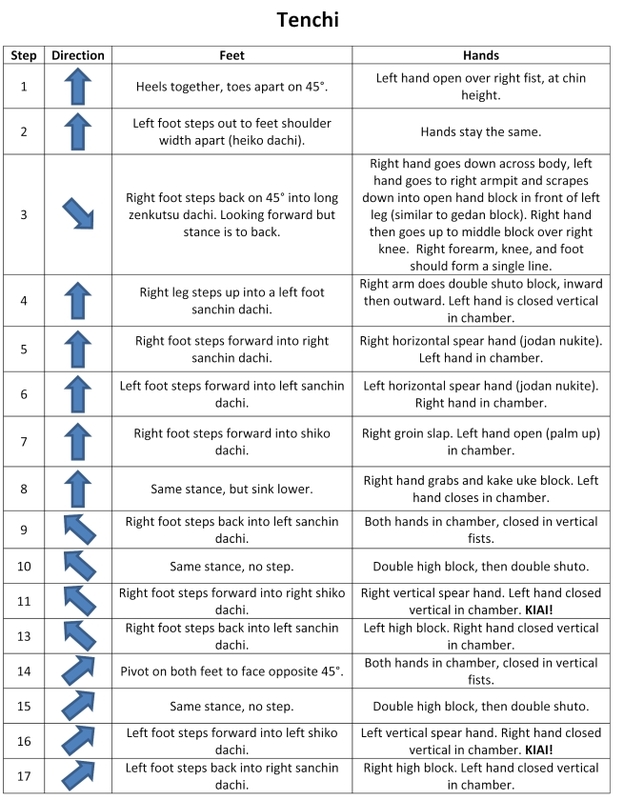 This can be very useful as you work on the sequence of steps because you can pause after each move, watch more complex parts over and over, check specific aspects like hand or foot positions, and so on. There may be variations in the way the kata is performed, but the basic sequence should be more or less the same as what you’re learning. Here’s an example of the kata Tenchi, which I am currently learning, as performed by the grandson of the grandmaster who developed this kata — obviously this is a reliable source to consult when learning the kata! Many complex things are learned more easily by writing them down. Working though a kata (by doing it, watching it on a video, or sitting and thinking about it) and writing down the sequence of steps will help to reinforce it in your memory. Writing down the steps of the kata has the added benefit of identifying steps that you’re uncertain of — just put a question mark there and move on to the next part you remember, or look it up, or ask about it at the next class. It also provides you with notes that you can keep with you as you practice, in case you get stuck. By way of example, here is a portion of the notes that I wrote down for the kata Tenchi, which I am currently working on. (Note that there may be some minor errors). The first part of the kata Tenchi. In my notes, there are about 40 steps in total. Click for larger image. 6) Visualize the steps of the kata. If you have a moment where your attention is not focused on something else (say, if you’re waiting for a meeting or riding on a bus), visualize the steps of the kata in your mind. This can be quite effective for remembering the basic sequence, though obviously it won’t help you to refine specific moves or commmit the kata to muscle memory the way physically performing it will. 7) Try to understand the logic and context of the kata. Kata are not random sequences of steps, they’re intended to represent specific defenses and counters to specific attacks. Sometimes knowing some very basic applications of the kata (bunkai) can help to remember the sequence. Also, if you get stuck, this can help you figure out what the next step must be, given the context of the kata. It’s similar to an actor who improves her ability to remember the lines for a play by considering the context of the scene and thinking like her character. 8 ) Ask for help and accept constructive criticism. For the most part, senior belts are happy to help newer students with kata. If you have a specific question about the details of a technique, or you’re stuck on a part of the sequence, simply ask. Remember that your Sensei has the last word on what is the correct way to perform the kata, but for issues of basic sequence and technique, anyone familiar with the kata ought to be able and willing to answer your question. One thing you will notice is that senior belts may need to perform a sequence in order to answer your query — this is because the kata has long since been committed to muscle memory for them. Also, if you get a chance to perform your kata in front of the class, go for it. This can lead to a lot of helpful feedback and it will let you know which parts you’re certain of and which ones you forget as soon as you are under a small amount of pressure. 9) Perform the kata in different places and facing different directions. A lot of new students only perform the kata in class, and only facing the front of the dojo. As soon as they have to turn and face a different direction, they get lost. 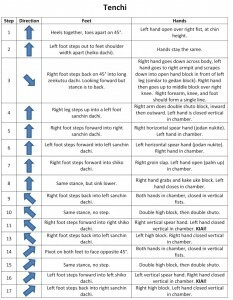 This indicates that they have memorized the kata steps with reference to other pieces of information, such as landmarks in the dojo, rather than actually learning the kata on its own. It is a good idea to break this habit early by performing the kata while facing different directions (e.g., after class) or in different places (e.g., at home). 10) Watch yourself performing the kata. Videotaping yourself performing the kata — which anyone can do now that phones and digital cameras are standard fare — can be extremely useful for pinpointing mistakes that you may be making. It’s the same reason athletes in many other sports use video analysis to improve their technique. I have not used this approach much in the past, but I intend to start this time around. If you just can’t bring yourself to watch yourself on tape, try performing the kata in front of a mirror and adjusting your stance or hand position as necessary. This can be quite helpful as you work to commit the steps and techniques to muscle memory. 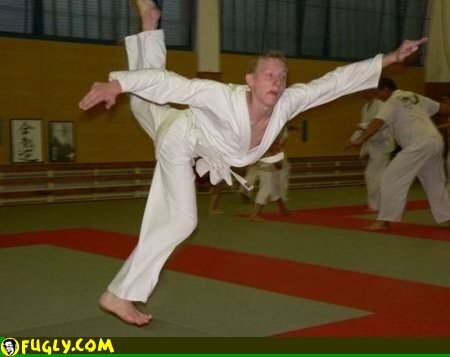 There is no easy way to learn a new kata. There are plenty of ways to make the process more difficult, however, so hopefully these tips will help you to learn a new kata as effectively as possible. Excellent page! Lots of work and research hours – Thanks for your great effort, for promoting our style and lineage and for doing all these selflessly! For videos of all of the Meibukan Katas, you might look at “Okinawa Traditional Goju Ryu Karate 3 DVD Box Set”. It was done by Meitatsu Yagi Sensei. It is in Japanese with some English. One is look to Sanchin. In Goju-Ryu, remember “Everything begins with Sanchin”. Two, keep a journal of corrections and comments made by constructive critics. I agree with Juan J. Adames. Very well done. Thanks — I have both DVD collections for the Meibukan kata, and I agree they are extremely helpful.